Well I slacked off for a solid five days last week. Thought I’d have a sunset hike on Friday but that fell through (thank you clouds) and I had a streak of 8 hour work days (god forbid I get a real job) that kept me stir crazy in Seattle and not in the mountains. The eventual goal is to update this three or four days a week, but of course that requires me to actually hike three or four days a week. The rain is coming, which hopefully means snow in the mountains. Snow is way better than rain. Anyway, this hike was actually from last Tuesday (yeah I’m a whole week late) which was a beautiful day. 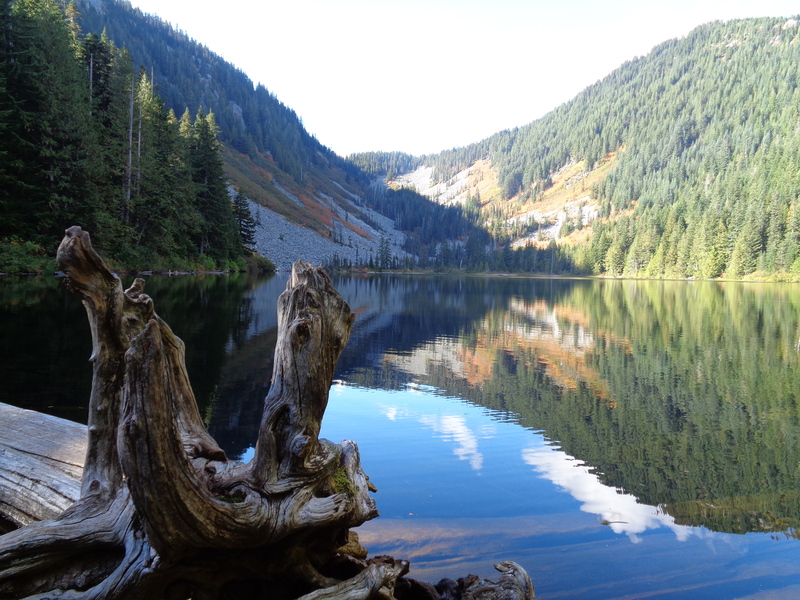 I got two hikes done, these lakes and Mount Catherine, which will be the next post. But here are Talapus and Ollalie! That top pic is one of my favorites. I did manage to get a blue sky in there, but I can’t figure out how to make the clouds look even remotely real (I’m trying to show how the water caught the reflection of the sky) so I uploaded the original. Someday when I’m a photo editing pro.. they’ll all be beautiful. 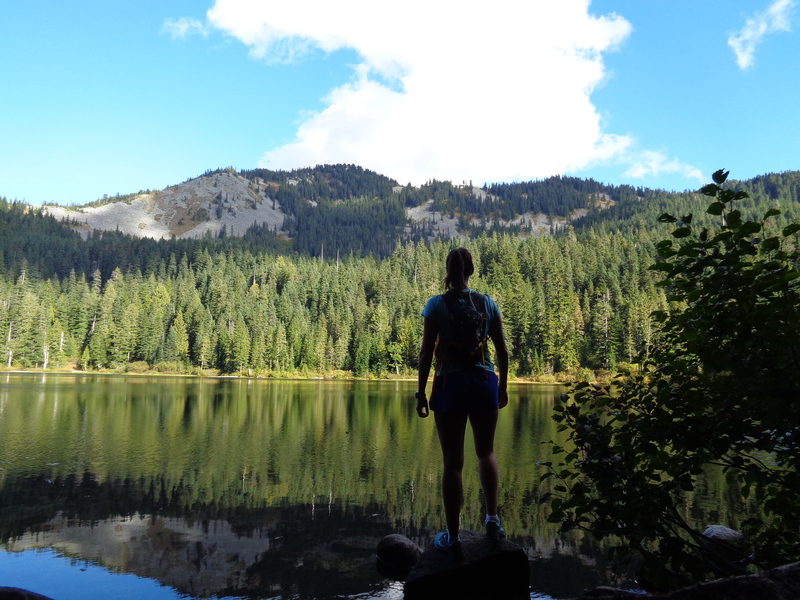 The original plan was to run to Rainbow and Island Lakes, which are a few miles beyond Talapus and Ollalie. But I wanted to get in a sunset hike after the lakes since who knows how many clear days we have left. I realized I didn’t have nearly enough time to do the 10-12 miles that Rainbow would require, so I turned around at Talapus. Also, I got lazy and this turned into a stroll through the woods. A few too many roots and mud patches to run some sections, and I never got into the groove, so I just chilled and counted it as an off day. I saw a few people heading back down on my way up, but it was late afternoon so I’m guessing it was busy earlier in the day. 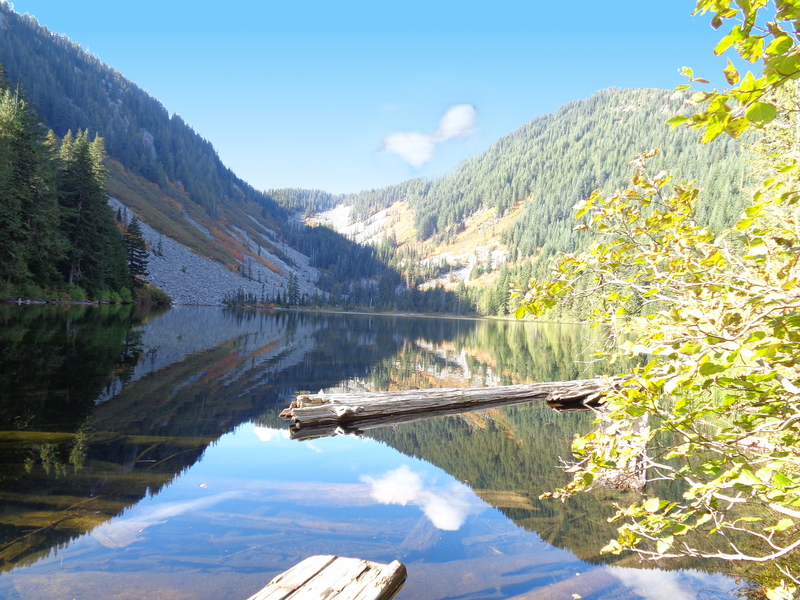 Talapus was the first lake I came across, and it was calm enough that I had the opportunity to get some cool reflection pictures since the sun was behind me. If only my camera didn’t blow out the damn sky every time, it’d be so much easier to get nice pictures. 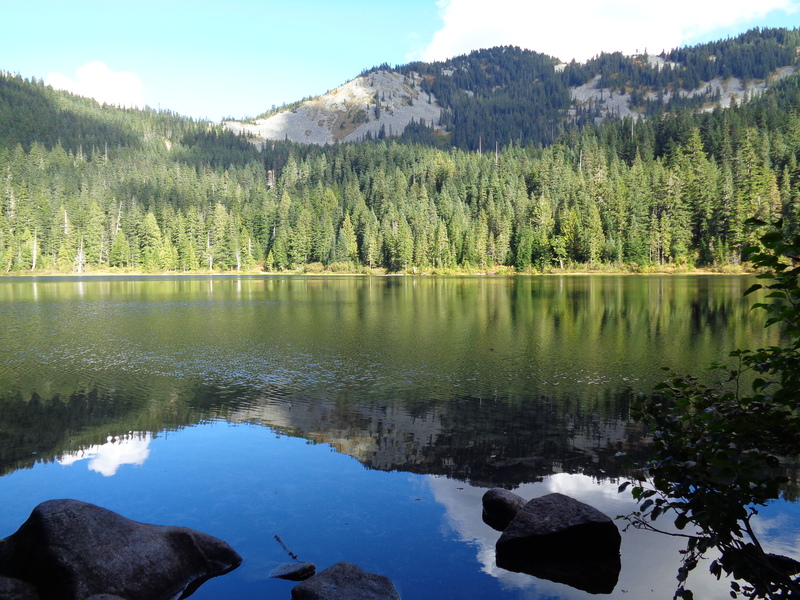 Olallie was a little bit rougher, so the reflections weren’t quite as smooth, but it was still beautiful. It was unbelievable quiet on this hike. Usually you can hear the commotion of I90, but not in this area. Maybe because there were so many streams, but I remember being surprised at the silence. I could hear two voices coming from somewhere, and finally figured out that they were on the opposite side of the lake (to the left, outside of the picture). There was a sandy spit over there where a couple was relaxing in the sun. All in all, this was definitely just a quick casual day hike. Perfect for anyone who isn’t a fan of exposure, heights, or steep climbs, but still wants a wilderness experience. I do wonder if they’re high enough to freeze over in the winter. I haven’t figured out the whole freezing level/snow level/etc deal as temperatures drop. The lakes are just above 3,000ft, so my guess is no, but it looks like the cascades get pretty snowy, so we’ll find out! I’m already excited for the snow to hit – snow levels are dropping to around 5,500ft this week in some areas, so some of the higher hikes might get a little bit! And if snow level is 5,500 this week, they must be lower in December/January. The only thing I haven’t considered yet is how to get to some of these trail heads, assuming they don’t plow the gravel roads, with my tiny manual front wheel drive car. I’ll cross that bridge when I get to it. Bonus cool mushrooms and a selfie. I’m still very unfamiliar with mushrooms, so everything is new and exciting. 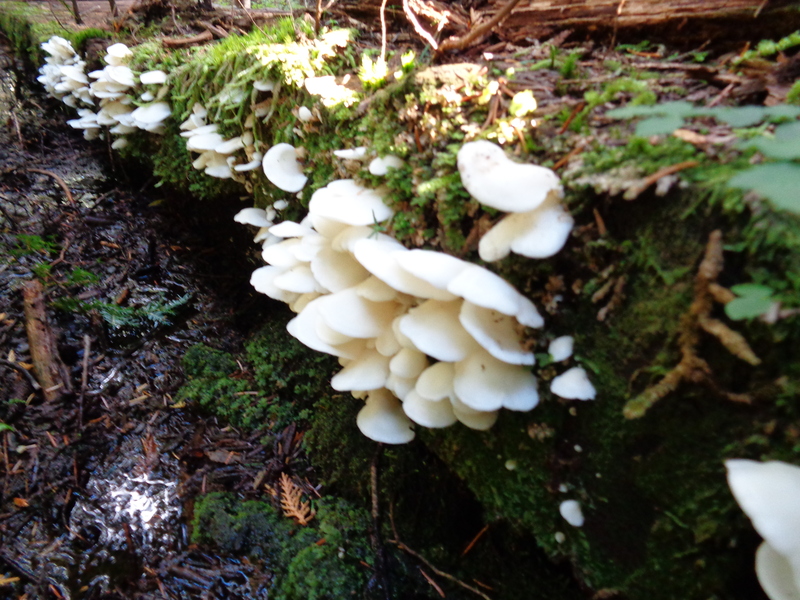 I’m sure I’ll run into these on other trails, but they were growing on the side of a wooden bridge and I thought they looked neat. The selfie was tougher to get but as usual I like to try and document myself there somehow. And just for kicks, I’m going to add a picture of a bridge (walkway?) going through the forest i the beginning of the trail. No one ever shows pictures of what the forest before the destinations look like, even on the WTA trip reports. I’m sure part of that is because they all offer similar things (mushrooms, trees, rocks, maybe some hanging moss) but sometimes they deserve to be documented. 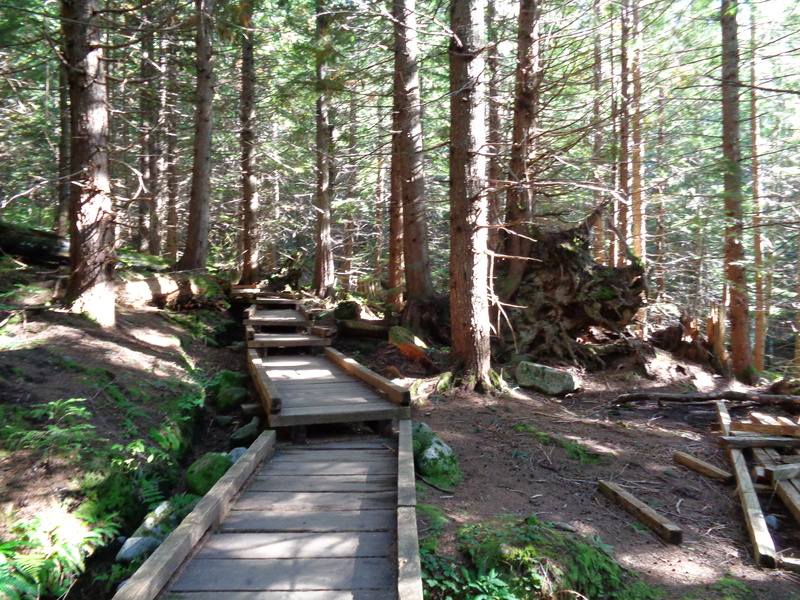 After all, the majority of every hike is spent in the woods, so you might as well appreciate it while you’re there!